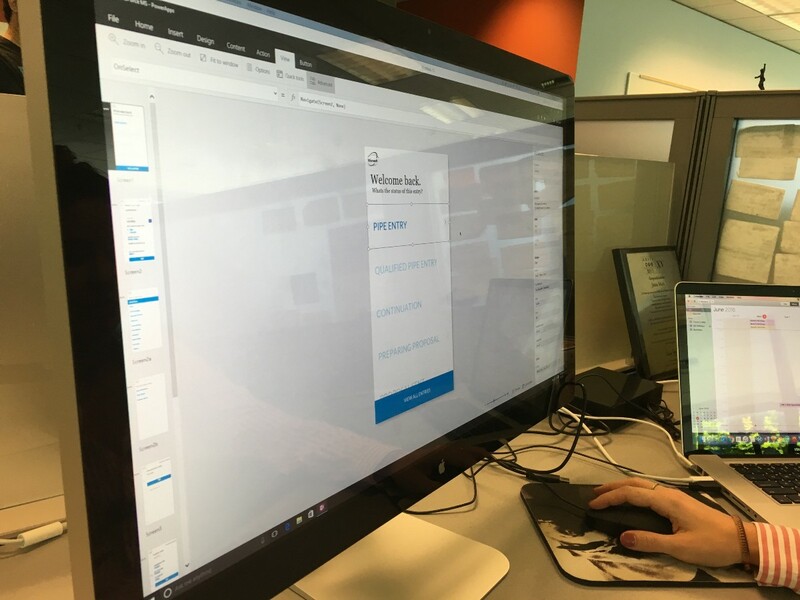 Reposting this great piece from our friends at HARMAN about their experience with PowerApps. Originally posted here on Medium. There’s an app for almost everything. What if you wanted an app for only one specific thing? Identify a new business problem and not far behind is an idea for an application a.k.a. a business solution. If you have an idea for an app to solve a business problem in your organization, and you want to create it quickly, then this post is for you. Follow the path our team took to create a fully functional business application in just a few days. Yes, days. Our journey started not unlike most mornings in our Seattle office: cloudy, grey, and busy. Amidst the bustle, a team of account and sales managers were using Salesforce, the world’s leading sales tracking tool, to enter and track leads. 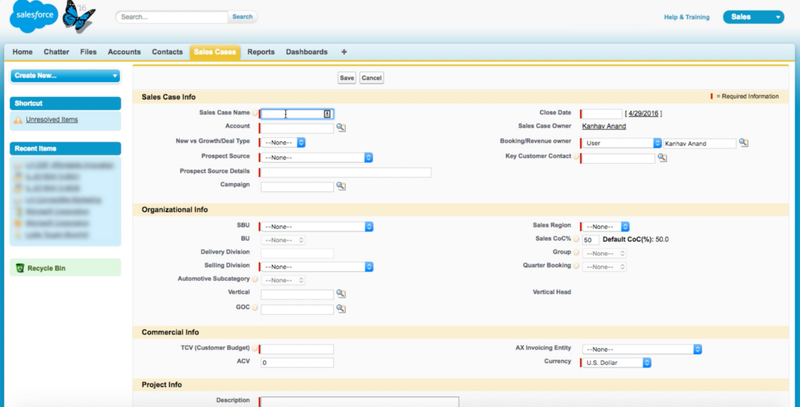 Companies can create fairly simple or complex schemas in Salesforce. While the particulars are important and something required by our organization, the complex schemas make the straightforward task of entering a sales case daunting, even to the savviest of users. And for our team, the complexity meant glazed eyes and mistakes. Incomplete forms were a source of frustration and miscommunication between the sales teams and management. Inaccurate entries restricted the team’s managers from doing their job properly. Useful or not, our system had over 80 different fields that needed to be filled-out for a sales case to be complete. We assumed the reason the entries were incomplete was because people were lazy. We tested our hypothesis by interviewing account managers and recording the experience of entering a sales case into the existing system. Come to find out, it took over five minutes to enter a sales case! Suddenly, it made sense why the tedious process moved to the bottom of the sales team’s daily “to do list.” There is no way to fill in 80 fields quickly or efficiently. It was clear, we needed a usable solution that motivated our teams to enter sales cases and collected the relevant information required by our organization. We formed a three-member team consisting of a representative end user, a user experience designer, and a developer. Born from these brainstorming sessions, was a mobile first approach that would allow users to enter sales related data accurately and quickly. Will I need an entire internal tools team to get this done? What about specialized developers who know how to work with IOS, Android and Windows platforms? Will I need those, too? Would I need a whole back end team who can work with SalesForce and get the data for the application to work? Making the app will take ages. Won’t I need to make designs, work with an engineering team and get the app tested? How am I going to deploy this across all the users in my organization quickly? Lucky for us, all of these worries are nonexistent with PowerApps. It is an innovative tool that allows anyone to build a fully functional app efficiently and quickly. As a rapid line of business app creation system, it was the best choice for us. We got cracking on the design. Two whiteboard sessions and a few hours later, we had an approach that we thought would work. We took that to PowerApps Studio and built out all the necessary screens. Screen design right inside of PowerApps. PowerApps has some great documentation and it’s really easy for someone to learn about all the various controls. Sharing apps with other members within the organization was a breeze. 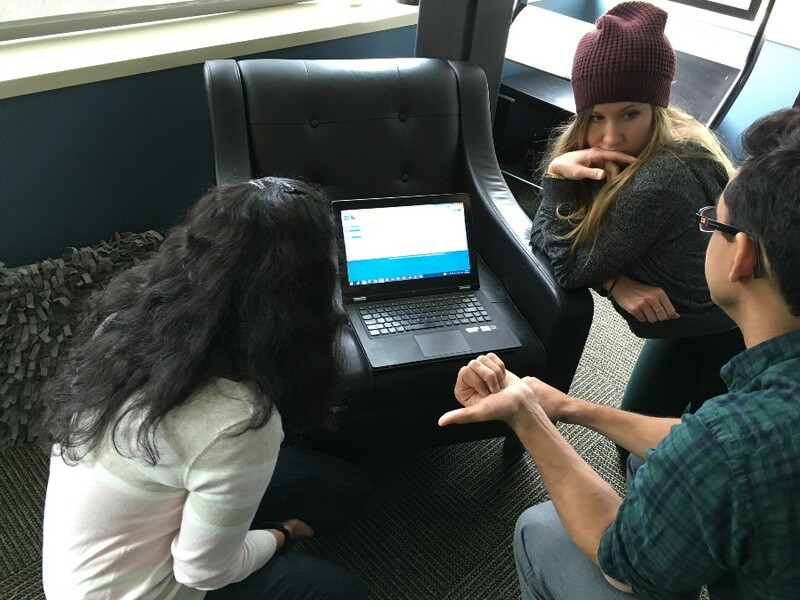 Normally, this would seem like a giant engineering task but with PowerApps, it was as simple as pointing to Salesforce, entering our credentials, and like magic, our data was there! Our developer took the screens that we had designed in PowerApps Studio and hooked it to the right data. Immediately, we had a usable app that anyone within the organization could start using without deployment headaches. It is as simple as “sharing” the application. Now talking about data sources, our app is only connected to SalesForce, but the true value of PowerApps is to create mash-up scenarios with multiple services. Mash-ups elevate the experience and utility of an app to new levels. We used Microsoft Flow in conjunction with PowerApps to integrate with Exchange and SMS alerts. Below is a list of all the data sources that PowerApps currently supports with many more to come. We plan to integrate Office 365 and OneDrive into this application in the second phase. The intent is to allow users to create sales cases from meetings and have OneDrive as a document repository for any case related documentation like SOWs, contracts, agreements, etc. We put the app into the hands of our small set of test users and they were able to breeze through a new sales case in about a minute compared to the 5 minutes that it took them earlier. Users love the fact that the app prefills a bunch of division specific information and only requires them to enter relevant data, helping them complete entries accurately. In a week’s time, we have seen a spike of 38% in new sales cases. Amazing job guys! We are in conversation with various business heads to see how our app can be rolled out to a larger audience. With the mashup scenarios, we have already identified future potential use cases that we plan to integrate into the app. In less than two weeks, through team collaboration and with the help of PowerApps we were able to create a cost effective, scalable, and user friendly solution for our, now, old business problem. 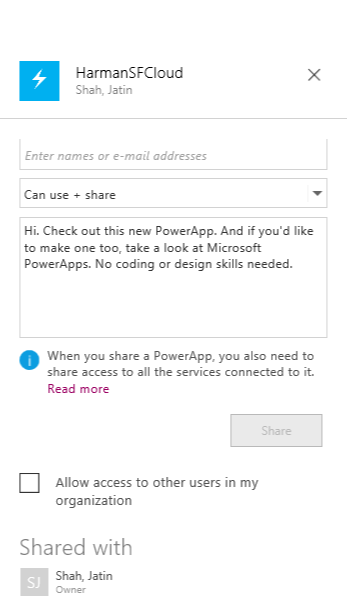 There’s an app for almost everything, but for everything else, there is PowerApps. hrough the eyes of the user. Our team comprises of researchers, designers, developers and project managers. HARMAN designs and engineers connected products and solutions for automakers, consumers, and enterprises worldwide, including connected car systems, audio and visual products, enterprise automation solutions and connected services.